Upon arrival at the festival, you will begin the unpacking and setting up camp process. This doesn’t have to be a total bummer if look at it like making a temporary home for yourself. Here are some tips on how to set up your space and make it the envy of the entire campgrounds. Getting to the festival as early as possible affords you the opportunity to scope out the superior sites first and stake claim on a little bit more land than those who arrive later. Some festivals give you little choice about where you are able to park or set up camp, however, some smaller festivals give you basically free reign of the grounds. Wander around a little bit and pick the right spot. A few things to look for include: shaded areas (woods, trees), proximity to bathrooms (close enough but not too close), and proximity to the stages. Less obvious perks to look for include soft ground free from many roots or rocky surfaces (easier to put in tent stakes), and a place with a recognizable landmark like artwork or a standing structure (this will make it easier for you to find later and also make it an easy place for your friends to find you). If you are traveling with multiple cars or setting up multiple tents try to position them around each other in a way that gives you maximum space, creating a bigger site to chill. Also take a look around and try to spot the “after party tent”. One is not always set up however it is a frequent occurrence. This is a tent which houses generally a large dance floor, giant speakers, turntables, strobe lights, and all another manner of loud crazy fun. 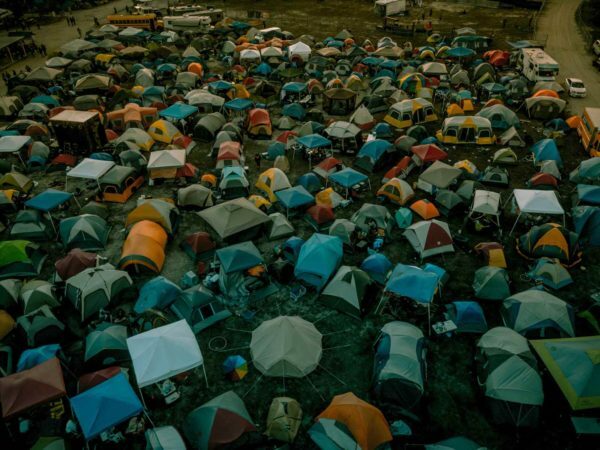 If you tend to be a person who enjoys staying up raging all night then embrace being close to this tent, contrariwise if you value getting any sort of sleep at all you may opt to seek out and avoid the neighboring areas. Once the location is picked out you can begin settling in for the weekend. Start with the essentials. If you are losing daylight get out the flashlights and lanterns first so those are ready to grab when you need them. Next, pull out the beer cooler, cuz you might as well have a beer while you’re setting up camp! Getting the tent set up is the next place to go because you can always put the other stuff off a bit but if you start partying you’re going to want a comfy place to hang your hat later. Once the tent is set up I like to set up my “bed”, blow up the air mattress and put on the sheets and pillows and spread out the sleeping bags. Then get out your clothes and spare blankets and put them in the tent so you can change clothes whenever you want or pull out extra hoodies or blankets in the night if it gets cold while you’re sleeping. The exception to this is if the weather is bad you want to leave all your clothes and bedding in the car in case the tent gets flooded. Pulling all the food out of the car right away is a good idea also. The inside of the car can get really hot so you may come back to a pile of rotten and melted supplies, or in some cases, soda bottles can explode and cause a world of headaches. If you take a little time to put your food and drinks in a good spot you can have quick access to them without having to fumble around in a car full of stuff. Some festival-goers like to leave all the supplies in the car and just pull them out as needed but I like to get comfortable and set everything up so it is easy to locate throughout the weekend. Putting all the cooking stuff in one place, the liquor in another, and so on can make your life a little easier. Anything super valuable can be locked up in the car but it is also a good idea to use tent locks so that you can secure all of your goodies in the tent when you leave for the shows. Most festival people are good souls but you can always count on a few jerks to take advantage and rip people off so taking some measures to avoid this is advised. After you have the basic setup the rest can be as simple or complex as you want. Some people like to set up a kind of family chill spot, perhaps with a canopy, a card table, some chairs, a stereo, or whatever you feel like having around to play with. Others set up tapestries on clotheslines, artwork, lights and other things to decorate the site a little bit. The beauty of it is that you can go as big or as basic as you want depending on your style. The only decoration I consider an essential is a flag or something to mark your site with. Cars, tents, and tarps all start to look the same in a big campground so it is really easy to get lost. Creating landmarks for yourself can help you find your way. If it is allowed then tiki torches can be easy to spot (just make sure they are secure and won’t catch anything on fire), and high flying balloons or tall flagpoles also work well.